Season pork with 1 teaspoon each salt and freshly cracked black pepper. Set aside to come to room temperature. Place onion and 1 teaspoon each salt flakes and black pepper in a bowl and set aside. Place chopped herbs in a separate bowl and cover with water to soak. Combine the garlic dip, 1 tablespoon olive oil, and 2 tablespoons lemon juice in a bowl. Preheat char grill or barbeque to medium high heat, add the pork fillet and cook, basting with garlic lemon mixture and turning every 5 minutes, for 15-20 minutes or until pork is just cooked through but still pink in the centre. Pork fillet will still feel quite rare when pushed with a finger. It will continue to cook while resting. Transfer to a plate and pour over any remaining lemon and garlic mixture. Cover loosely with foil and rest for 5 minutes. Add tomatoes to BBQ and cook, covered loosely with foil, for 5 minutes, or until just blistered. Set aside with pork. To assemble tabouli, drain herbs and add to onion mixture, stir through quinoa, remaining 1 tablespoon olive oil, and remaining 2 tablespoons lemon juice. Stir to combine. 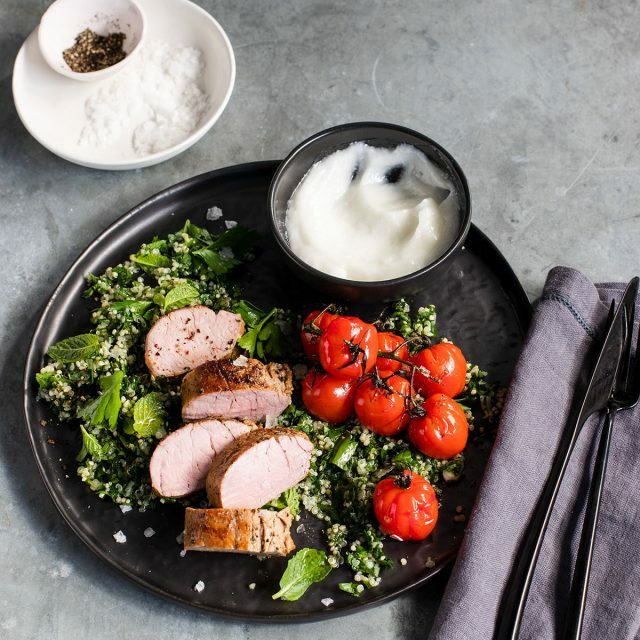 Thickly slice pork and serve with tabouli, roasted tomatoes, lemon wedges and extra garlic dip alongside.